Cerebral microbleeds (microbleeds) are small, punctuate hypointense lesions seen in T2* Gradient-Recall Echo (GRE) and Susceptibility-Weighted (SWI) Magnetic Resonance Imaging (MRI) sequences, corresponding to areas of hemosiderin breakdown products from prior microscopic hemorrhages. They occur in the setting of impaired small vessel integrity, commonly due to either hypertensive vasculopathy or cerebral amyloid angiopathy. Microbleeds are more prevalent in individuals with Alzheimer’s disease (AD) dementia and in those with both ischemic and hemorrhagic stroke. However they are also found in asymptomatic individuals, with increasing prevalence with age, particularly in carriers of the Apolipoprotein (APOE) ε4 allele. Other neuroimaging findings that have been linked with microbleeds include lacunar infarcts and white matter hyperintensities on MRI, and increased cerebral β-amyloid burden using 11C-PiB Positron Emission Tomography. The presence of microbleeds has been suggested to confer increased risk of incident intracerebral hemorrhage – particularly in the setting of anticoagulation – and of complications of immunotherapy for AD. Prospective data regarding the natural history and sequelae of microbleeds are currently limited, however there is a growing evidence base that will serve to inform clinical decision-making in the future. Symptomatic Intracerebral Hemorrhage (ICH) affects 30–40 per 10,000 annually (1), and can have devastating clinical outcomes (2). Well-known modifiable risk factors for ICH include hypertension (3), smoking (4), alcohol (5, 6), and diabetes (7). In addition, recent developments in neuroimaging have led to a greater understanding of pathophysiology and risk of ICH (8). Presence of hypertensive arteriolosclerosis and cerebral amyloid angiopathy (CAA) are contributory in an estimated 78–88% of primary ICH (9). In both of these conditions, prior to emergence of symptomatic ICH, there may be evidence of smaller, possibly subclinical hemorrhages, reflective of underlying vascular fragility. These lesions, termed cerebral “microbleeds” (microbleeds) may be an indicator of increased risk for future macroscopic hemorrhage (10, 11). As well as being associated with ICH, microbleeds are associated with ischemic stroke (IS) (12), Alzheimer’s Disease (AD) (13), and AD immunotherapy (14, 15), and they are seen with an age-dependent higher prevalence in cognitively normal elderly (16, 17). They are also seen secondary to trauma, inflammatory conditions, and several genetic disorders (18, 19). Previously considered to be clinically silent (20–22), an increasing number of studies have linked presence of microbleeds and cognitive decline (23, 24), in addition to being a putative marker of future stroke risk (10, 25, 26). This review recapitulates recent clinical and neuroimaging literature regarding cerebral microbleeds, in particular addressing their associated risk factors and prognostic implications. The terms, “cerebral microbleeds,” or “microhemorrhages,” refer to small, round, or ovoid hypointensities, of <10 mm in diameter, evident on T2* Gradient-Recall Echo (GRE) or Susceptibility-Weighted (SWI) MRI sequences. These sequences provide high contrast between brain parenchyma and paramagnetic material, such as deoxyhemoglobin, superparamagnetic hemosiderin, and diamagnetic calcium (27, 28), and are capable of detecting bleeding from vessels as small as 200 μm in diameter (29). An associated finding on these magnetic resonance imaging (MRI) sequences is superficial siderosis (SS), presence of residual leptomeningeal hemosiderin deposits after small vessel rupture within the subarachnoid space (30). The terminology distinguishes “microbleeds” seen on MRI from small lesions visible under light microscopy at post-mortem [also termed “mini-bleeds” (31)]. The first histopathological correlations with microbleeds were published by Tanaka et al. (29) and Fazekas et al. (32) each noting that sites of hypointensities seen on MRI corresponded to areas of hemosiderin, deposited around arteriosclerotic vessels (29, 32). More recently, Shoamanesh and colleagues reviewed the histopathology of 18 patients from five published studies: six with dementia, seven ICH, one IS, and four with other pathologies. Microbleeds on MRI were associated with evidence in prior bleeding in 81% (e.g., hemosiderin-laden macrophages or old hematoma). Other infrequent findings included pseudocalcification, a microaneurysm, and a distended dissected vessel. Other non-specific findings were seen in 13% of cases. Associated vascular pathology seen was most commonly lipohyalinosis or vascular β-amyloid deposition, the latter seen predominantly in individuals with dementia (33). Evidence from both clinico-pathological correlations and large epidemiological studies also support differing patterns of distribution of microbleeds according to their etiology. MB in deep subcortical or infratentorial areas are usually associated with the presence of hypertensive disease or vascular risk factors (VRF) (16, 34), with lipohyalinosis being the predominant finding at post-mortem (33). Hemorrhages in a lobar, cortico-subcortical distribution are associated with Apolipoprotein E (APOE) ε2 (35) and APOE ε4 carrier status (16, 34), β-amyloid burden on 11C-PiB positron emission tomography (PET) (36), and evidence of CAA at post-mortem (32). In the setting of trauma, microbleeds have been reported more frequently in mid-subcortical cerebrum, above the corpus callosum, whereas non-traumatic microbleeds were found in lateral subcortical areas, basal ganglia, and thalamus (37). Microbleeds in the cerebellum have been associated with both presence of CAA and with arteriosclerotic disease (38). In individuals presenting with symptomatic ICH, criteria to support diagnosis of CAA have been proposed (1) and validated with histopathology, known as the Boston Criteria (39), outlined in Table 1. Inclusion of microbleeds (40) and SS (41) have been suggested to improve the sensitivity of the Boston Criteria for detection of CAA, particularly with lesions detected in asymptomatic individuals. Table 1. 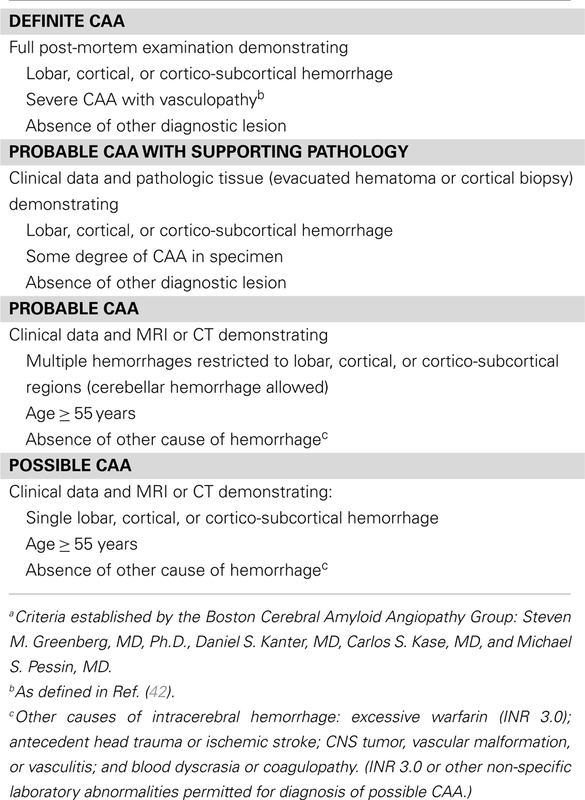 Boston criteria for cerebral amyloid. angiopathya. In patients with probable CAA, lobar microbleeds occur more frequently in posterior structures (43). This corresponds to the distribution of CAA-laden vessels described at post-mortem (44). A similar pattern of distribution has been observed in AD patients, supporting that that CAA also underlies a majority of these lesions in AD (13). Other studies have reported discordant findings, or variability according to clinical groups or definition of anatomical landmarks. In one study of community-dwelling elderly, lobar microbleeds were most prevalent in posterior temporal and parietal, but not occipital lobes, while the large, population-based Age, Gene/Environment Susceptibility study (AGES) showed no regional predominance at all (17). One study of patients with subcortical vascular dementia (VaD), with high prevalence of VRF and Lacunar Infarction (LI) (in whom one might expect to find deep MB) the majority of lesions detected were actually lobar microbleeds (45) However, this study did not include a β-amyloid biomarker [e.g., cerebrospinal fluid (CSF) or PET imaging] and so it is possible that many of these patients may have had mixed pathologies (e.g., LI with concomitant AD-pathology). Genetic factors associated with microbleeds include polymorphisms linked with sporadic microbleeds and less common mutations seen with familial conditions. The most common gene polymorphism associated with sporadic microbleeds is the Apolipoprotein E (APOE) gene on chromosome 19. The APOE ε2 and ε4 alleles have each been independently associated with lobar microbleeds (16, 35), APOE ε4 associated with greater vascular Aβ deposition, with loss of smooth muscle and vessel wall thickening (46–48), whereas ε2 with fibrinoid necrosis (49). In their meta-analysis of over 7000 subjects, Maxwell and colleagues found that ε4 was also associated with deep microbleeds, but also that there was no increase in odds of microbleeds in ε2 compared with ε3 (50). In addition, genome-wide association studies (GWAS) have identified polymorphisms associated with more severe CAA include neprilysin (a proteolytic enzyme responsible for Aβ catabolism (51)) and single-nucleotide polymorphism rs6656401 within the Complement Receptor-1 gene (52). It could be inferred that these also represent higher risk of microbleeds, although this remains to be demonstrated. Mutations associated with microbleeds in familial conditions include NOTCH-3 in Cerebral Autosomal Dominant Arteriopathy with Subcortical Infarcts and Leukoencephalopathy (CADASIL) (53), APP E693Q and D694N in Dutch-type (40, 54) or Iowa-type (55) CAA, and APP and presenilin mutations in familial AD (56, 57). The most commonly used sequences to demonstrate microbleeds are T2* Gradient-Recall Echo (T2*GRE) and Susceptibility-Weighted (SWI) MRI. These provide high contrast between brain parenchyma and highly paramagnetic material, such as deoxyhemoglobin, superparamagnetic hemosiderin, and diamagnetic calcium (27, 28), and are sensitive to rupture of blood vessels as small as 200 μm in diameter (29). The choice of sequence and imaging parameters – such as echo time, field strength, and slice thickness – affects the size, clarity, and number of lesions identified (58, 59). This represents a source of heterogeneity between studies, and as such, can limit direct comparison of findings. For example, increasing field strength from 1.5 to 3 T increases the contrast to noise, “visibility rating,” and number of microbleeds detected by approximately 30% (60, 61). Recent work using 7 T MRI may further improve reliability of detection of MB (62), however one study with post-mortem correlation has suggested that at this field strength, non-hemorrhagic iron deposition may mimic microbleeds, resulting in poorer diagnostic specificity (63). SWI increases the effect of conventional T2*GRE by image post-processing, multiplying magnetic resonance signal magnitude with the signal pulse shift. This provides greater contrast compared with T2* GRE, resulting in detection of 50–70% more lesions (59, 64, 65). However, whether this increase in lesion identification translates to a clinically meaningful difference is debated. Goos et al. found that although SWI enabled identification of nearly twice as many lesions as T2* GRE, this did not alter any of the clinical associations in multivariate analyses (64). As differences in assessment of microbleeds can contribute to considerable heterogeneity in the literature, efforts have been made to standardize approaches to their reading and definition Inter-observer agreement for identification of microbleeds varies in the literature from k = 0.3–0.97 (66). To address this, rating scales divide lesions into certain or uncertain, as well as by location, with significant improvement in inter-rater reliability (66, 67). Greater reader confidence has also been reported when microbleeds are present on serial images, read sequentially (68). Microbleeds may also “disappear” over time – although it is unknown how often this is due to true physiological resorption, as opposed to an imaging artifact (69–72). Attempts have also been made to improve detection of microbleeds using automated algorithms. Although these may be useful in screening for multiple lobar microbleeds, to date they have not replaced manual assessment as although sensitive, they tend to lack specificity (73, 74). Microbleeds are frequently identified in association with other MRI evidence of cerebrovascular pathology, in particular markers of cerebral small vessel disease (SVD). Lobar and deep ICH, IS, particular LI, and white matter hyperintensities [WMH, seen with T2/Fluid Attenuated Inversion Recovery (FLAIR) MRI sequences], have each been demonstrated in association with microbleeds in diverse populations (69, 75, 76). A relationship between microbleeds and severity of WMH, or leukoaraiosis, has been demonstrated in ischemic and hemorrhagic stroke patients (12, 69, 75–77), AD (13, 78, 79), VaD (80), and community-dwelling elderly (16, 23). Deep (16), diffuse (deep and lobar) (76), and strictly lobar MB (70) have each been associated with greater WMH. Just as the distribution of microbleeds appears to vary according to the etiology and severity of SVD, so too may the pattern of WMH. A posterior-predominant distribution of WMH has been reported in AD patients with microbleeds, and in individuals with lobar ICH, reflecting the predilection of CAA pathology in these areas at post-mortem (13, 81). These findings have not been universally reported, however, with some finding no difference in WMH distribution between CAA, AD, and NC individuals (82). This may be explained by the fact that WMH have been correlated with a spectrum of post-mortem findings from tissue rarefaction, to myelin and axonal loss and mild gliosis (83), and a diverse list of possible contributing pathologies, including neurodegeneration, inflammation, and hypoxia (84). Microbleeds have also been associated with presence of hippocampal atrophy in a large study of cognitively normal individuals, an association possibly mediated by CAA in the presence of underlying AD-pathology (85). More recently, an association has also been reported between lobar microbleeds and prominent perivascular spaces in cerebral white matter, but not deep brain structures (86). They hypothesized that abluminal accumulation of β-amyloid may mediate dilatation of the perivascular space in patients with CAA. Positron Emission Tomography imaging with N-methyl-[11C]2-(4-methylaminophenyl)-6-hydroxybenzothiazole, also known as Pittsburgh Compound B, or “PiB” was first used to demonstrate presence of fibrillar β-amyloid in vivo in individuals with AD (87). PiB can also highlight presence of β-amyloid in cerebral vessel walls, even in the absence of parenchymal plaques, both in vitro (88) and in vivo with subsequent post-mortem follow-up (89, 90). Patients with symptomatic ICH meeting criteria for probable CAA present with PiB retention midway between AD patients and controls (91, 92), with higher PiB retention in the occipital region (relative to other cortical regions) than AD patients, consistent with a previously reported predilection of CAA for posterior brain structures (43, 44). In individuals with CAA, regions of increased PiB retention have been shown to coincide with sites of microbleeds, and with incident microbleeds at follow-up (93, 94). In cognitively normal controls, PiB retention has also been shown to correlate with lobar, but not deep microbleeds (36) (Figures 1 and 2). In multivariate analysis, PiB and age were independent predictors of lobar microbleeds, whereas presence of VRF, gender, and APOE were not. APOE ε4 carriage, a predictor of Lobar microbleeds in large population studies, is less strongly associated with LMB when adjusted for Aβ-burden, suggesting that the association between APOE ε4 and microbleeds may be mediated by Aβ (36, 95). Figure 1. Diffuse (predominantly non-lobar) Microbleeds in an 81-year-old lady referred with AD-type dementia (MMSE 22/30, CDR 1, CDR-SOB 5.5). 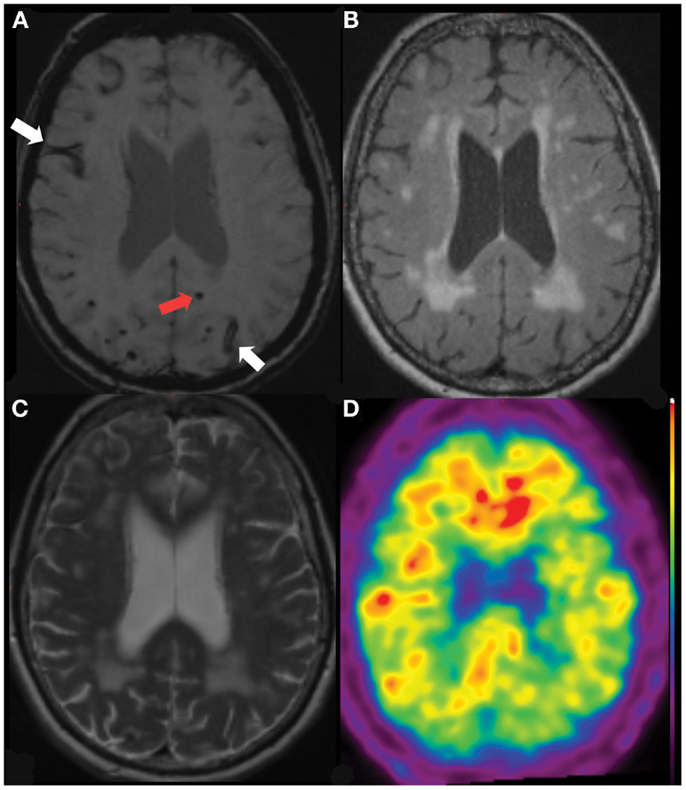 SWI image (A), with coregistered FLAIR (B), T2 (C) and 11C-PiB PET (D) images demonstrating severe deep white matter hyperintensities but no significant beta-amyloid burden (neocortical SUVR = 1.2), suggesting that the presentation is due to severe cerebral small vessel disease, rather than Alzheimer’s disease. Figure 2. Lobar Microbleed (red arrow) and Superficial Hemosiderosis (white arrows) in a 66-year-old lady referred initially with amnestic MCI (MMSE 22/30, CDR 0.5, CDR-SOB 4.5), subsequently diagnosed with AD-type dementia. 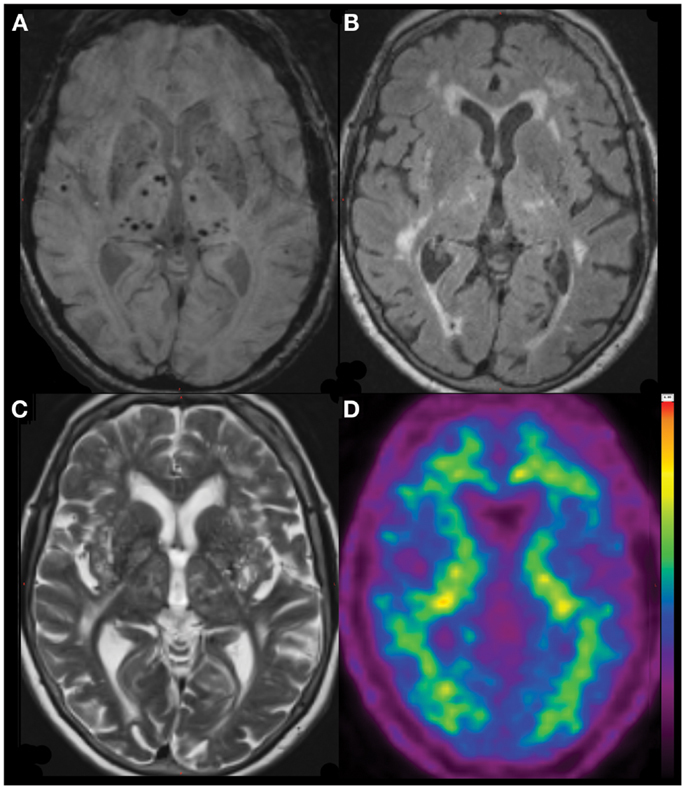 SWI image (A), with coregistered FLAIR (B), T2 (C) and 11C-PiB PET (D) images demonstrating severe deep white matter hyperintensities with elevated beta-amyloid burden (neocortical SUVR = 1.7). Use of molecular imaging for β-amyloid has shed new light on disease processes that were previously only identifiable at post mortem. However, currently available Aβ PET ligands are known to bind to fibrillar Aβ in both plaque and vessel walls. Hence, the relative contribution of each to the PET signal cannot be distinguished. A recent correlation observed between PiB and WMH volume in patients with probable CAA (but not AD or cognitively normal controls), might indicate that in some cases, much of the PiB signal may indeed be due to vascular, rather than parenchymal Aβ (96). Future work involving novel radioligands, selective for Aβ within vessel walls, have potential to clarify this (97, 98). Use of other Aβ biomarkers, such as plasma and CSF assays have also been used to correlate with microbleeds. Profiles of Aβ40/42, total-tau, and phospho-tau may distinguish between AD, CAA, and NC (99) and between CAA and other causes of vascular disease (100). While microbleeds had previously been considered to be clinically silent, recent contributions to the literature have led to reassessment of their clinical and prognostic relevance. Table S1 in Supplementary Material outlines the prevalence of microbleeds in different clinical conditions, from community-dwelling elderly, free from cognitive impairment and neurologic disease, to ischemic and hemorrhagic cerebrovascular disease, different forms of dementia and genetic diseases. In population studies, microbleeds are more prevalent with increasing age, from 6% aged 45–50 years, to 36% aged 80 or more (16). Individuals with no known vascular disease or risk factors may be at lower risk of microbleeds (prevalence 2.3%) (85). In the setting of stroke, microbleeds are reported more frequently in ICH (prevalence 19–83%) than IS (15–35%) (10, 22, 29, 76, 77, 101–106). Of the IS subtypes, microbleeds occur more often in those with LI (LI, 26–62%) than atherothrombotic (21–46%) or cardio-embolic infarctions (4–30%) (22, 75, 76, 80, 104, 107). This is in keeping with post-mortem findings of small vessel lipohyalinosis in many individuals with microbleeds (33). In comparison with cognitively normal controls (0–19%), microbleeds are more frequent in individuals with Mild Cognitive Impairment (MCI) (20–43%), patients with AD (18–32%), and VaD (65–85%) (13, 45, 72, 79, 80, 100, 108, 109). Microbleeds are also more prevalent individuals with progressive (31–54%), rather than stable MCI (36%) (72, 108), perhaps reflecting more severe SVD or AD-related pathology in these individuals. Microbleeds have been reported in between 19 and 70% of individuals with CADASIL (19, 110, 111), and 67% of individuals with familial CAA (40). MB have also been reported in the setting of autoimmune encephalitides (112) and head trauma (65, 71, 113). Few studies report rates of accumulation or incidence for microbleeds to date, with none that separate incident microbleeds by location. Lee prospectively reviewed 224 patients presenting with stroke or TIA over 3 years, reporting an incidence of 0.8 new microbleeds/year overall, increasing to 5.4/year in patients with multiple (≥5) baseline microbleeds (69). Another study of 26 patients with possible or probable CAA reported new microbleeds at 1 year in 46% of individuals (114), whereas the Rotterdam study of community-dwelling elderly reported an increase of prevalence of microbleeds from 24.4% at baseline to 28% at 3 years (70), although neither specify incidence per se. It remains to be clarified whether microbleeds, once present, remain indefinitely, or if they regress over time. The majority of lesions appear to persist over serial scans, with only 1.4–2.3% of lesions “disappearing” (70, 115–117). However, others have reported lesions that appear to resolve progressively over time (69, 71). However, it is unclear whether microbleeds truly resolve, or if their “disappearance” is due to artifact or erroneous interpretation of baseline images (70). In one study of acute stroke patients, MB disappeared in a considerable 14.5% of cases, interestingly with disappearing lesions being associated with higher levels of LDL-cholesterol. The authors hypothesized that cholesterol levels may influence clearance of hemosiderin-laden macrophages, however also cautioned that these findings required validation in other studies (69). In several longitudinal observational studies, the development of new microbleeds has been shown to be associated with presence of baseline microbleeds, markers of associated SVD (e.g., LI, ICH, WMH severity). These associations appear to hold true, despite diverse clinical populations studied (e.g., IS, ICH, or general population) (11, 69, 70, 114). In addition, in individuals with CAA, new microbleeds are associated with carriage of both APOE ε2 and ε4 (11). When microbleeds are stratified by location, elevated systolic blood pressure (70, 118, 119), LI, and larger WMH volume predict incident deep or infratentorial microbleeds (70), whereas APOE ε4/ε4 genotype and larger WMH volume predict incident lobar microbleeds (70). Liu and colleagues noted that variability in blood pressure predicted microbleeds progression in deep and infratentorial regions only. They hypothesized that in deep and infratentorial regions, penetrating artery branches arise directly from large vessels and hence are more vulnerable to blood pressure variability than cortical vessels, where no association was seen (119). Microbleeds are of significant interest in AD, both as an indication of risk of future hemorrhage, possible mediator of cognitive impairment, and more recently, as a marker of immunotherapy-related adverse events (Amyloid-Related Imaging Abnormalities, ARIA) (15). In AD patients, while microbleeds have been associated with imaging markers of small vessel pathology such as WMH, they are less associated with strokes or VRF (78, 79). Microbleeds in AD are most often seen in cortico-subcortical distributions, and most individuals with AD have at least some CAA at post-mortem (44), which would implicate underlying CAA in the majority of microbleeds in AD. Microbleeds are also recently described findings in treatment trials for AD, termed “Amyloid-Related Imaging Abnormalities” (“ARIA”). This term incorporates microHemorrhage and Hemosiderosis (ARIA-H) and vasogenic Edema and Effusions (ARIA-E), suggested to relate to altered Aβ trafficking in these individuals. ARIA gained attention following publication of phase I and II studies of bapineuzumab, a humanized monoclonal antibody specific to the N-terminal region of Aβ (14, 120, 121) although similar findings were also previously noted in human and animal reports with active immunotherapy and rarely, spontaneous inflammatory CAA (122–126). Overall in the bapineuzumab study, ARIA-E were identified in 17% of cases, of whom 78% were asymptomatic. Coincident hemorrhage or hemosiderosis occurred in 47%. There was an increased risk of ARIA-E in patients treated with higher doses and in APOE ε4 homozygotes. There was no association between ARIA-E and age, gender, or WMH, and presence of microbleeds at baseline did not increase risk of incident ARIA-E (although participants with multiple microbleeds were excluded from participation). Although ARIA-E commonly preceded or coincided with ARIA-H, the two findings were not necessarily co-located, suggesting a generalized disruption of vascular integrity, rather than a focal insult. It is hypothesized that immunotherapy may precipitate failure of saturable perivascular Aβ clearance mechanisms by massive mobilization of soluble from sequestered Aβ. Hence, waste that is otherwise soluble (e.g., Aβ) accumulates, causing altered vascular permeability, and leakage of plasma and blood products (127). ARIA-E has also been reported with other Aβ immunotherapeutic agents, albeit less frequently (128) and a gamma-secretase inhibitor (129), whereas by contrast, “spontaneous ARIA-E” is uncommon. Of 2762 baseline or screening MRI of mild-moderate AD patients enrolling in clinical trials, there were only four cases of VE, only one of which was associated with microbleeds (130). Aside from being an incidental finding in AD patients, there is growing evidence that microbleeds may confer increased risk of cognitive impairment, and future cognitive decline. The effect of microbleeds may be due to focal damage or dysfunction, or be representative of more generalized processes, such as SVD from HT or CAA, or widespread β-amyloid pathology (24). Rosidi and colleagues proposed a model whereby microbleeds themselves, while not directly causing neuronal injury, leads to a sustained local inflammatory response, characterized by initial activation and persistent increase in microglia and macrophages, due to leakage of blood plasma into brain parenchyma. This inflammatory response appears to coincide with the extent of plasma leakage, supporting the hypothesis that this leakage may be the initiating event in the process, with ongoing inflammation then leading to neuronal dysfunction and cell death (131). Studies into cognitive sequelae of microbleeds have been limited by heterogeneity in imaging parameters, sensitivity of cognitive measures, study demographics, and consequently, different patterns in distribution of microbleeds. The majority of cross-sectional studies of the cognitive impact of microbleeds report finding impairments in executive function, with some also reporting decrements in attention, processing speed, and global cognition (132–135). However, not all studies report cognitive associations according to location of microbleeds, which impedes comparison between cohorts. The Rotterdam Study reported independent associations between multiple (≥5) lobar microbleeds and all cognitive domains except memory. However deep microbleeds were not significantly associated with cognition, after adjusting for other possible confounding variables such as age and education (136). In the RUN-DMC study, deep microbleeds were associated with global cognition, psychomotor speed, and attention, whereas lobar microbleeds were associated with global cognition, memory, and executive function. Temporal lobe microbleeds were most associated with memory and attention, whereas frontal microbleeds were associated with memory, psychomotor speed, concept shifting, and attention (132). In a third study, Gregoire et al. reported that strictly lobar, but not deep microbleeds were associated with executive impairment in IS/TIA patients (137). In each study, the cognitive associations of microbleeds were independent of other markers of arteriosclerotic SVD, although there was no mechanism to adjust for presence of concomitant AD-pathology. It has, however, been shown with post-mortem histopathology that presence of moderate to severe CAA is linked with poorer cognitive scores (perceptual speed and episodic memory) during life even after correcting for presence of parenchymal Aβ-plaques (138). It could therefore be expected that some of the cognitive association of microbleeds may also be robust to adjustment for presence of parenchymal Aβ. In AD patients, one study reported no difference in cognition between those with and without microbleeds (although there was a trend to poorer processing speed) (13), whereas in Subcortical VaD, microbleeds have been associated with impairment in numerous cognitive domains, including attention, verbal memory, visual memory, language, visuospatial function, and executive function. The large number of parietotemporal lesions in this cohort does suggest that some lesions may well be due to presence of CAA, and that parenchymal Aβ could be an important potential confounder driving some of these findings (45). Microbleeds may also manifest in other cognitive or behavioral symptoms, according to their location. In 517 patients with IS, Tang (103) found an association between post-stroke emotional lability and microbleeds in the thalamus, but not other regions. No association was shown between emotional lability and WMH or infarcts. There are few studies to date with illustrating the prognostic implication of microbleeds on cognition over time. Presence of microbleeds may predict the development of cognitive impairment in ICH patients (11), and conversely, in individuals with cognitive impairment post-stroke, those without microbleeds are four times more likely to revert to normal cognition than those with microbleeds (139). Microbleeds have been predictive of cognitive deterioration in individuals with MCI in two studies (68, 72) but not another (108). Overall, microbleeds are associated with many risk factors for cerebrovascular pathology, including advancing age (23, 75, 140, 141), hypertension (10, 29, 75, 76, 111, 142), diabetes (111, 140), cigarette smoking (143). In one meta-analysis, hypertension, and diabetes remained significantly associated with microbleeds, whereas gender and smoking were not (144). Hypercholesterolemia is less strongly associated with microbleeds. In one study of ICH patients, low cholesterol level was associated with microbleeds (10), whereas other studies show no association (101, 142). In several studies, statin therapy for hypercholesterolemia has been implicated in increased risk of ICH (145, 146), although this has not been supported in a more recent meta-analysis (147). Not all studies support an association between VRF and microbleeds. Both the large Framingham and AGES-Reykjavik cohorts failed to find any association (17, 141). The regional predominance of microbleeds in each study may have influenced these findings – for example, lobar microbleeds are not generally associated with VRF (16, 36) – although as these studies did not report lesion topography this can only be postulated. Microbleeds are frequently identified in the setting of ICH, both in lobar or deep locations (11, 77, 148). Risk factors for microbleeds in ICH include advanced age, advanced leukoaraiosis, and lacunar infarcts (149). In individuals with ICH, a bimodal distribution of hemorrhage volume has been reported, with lesions tending to either <5 mm or >29 mm in diameter. Histopathologically, individuals with greatest microbleeds burden have increased vessel wall thickness compared with those with fewer microbleeds, however the prevalence of CAA-affected vessels does not differ (150). Microbleeds are also common in individuals with IS, particularly with deep brain or lacunar infarcts, and atherosclerotic but not cardio-embolic disease (140). In IS patients, microbleeds are associated with advanced age, diabetes and prior use of antithrombotic drugs (140), and deep microbleeds have also been associated with hypertension (76). They are about four times more likely to be found in individuals with recurrent stroke than primary stroke, suggesting that they could be used as a prognostic marker (12, 107). In longitudinal studies, microbleeds are predictive of future cerebrovascular events both in individuals with stroke, and in community-dwelling elderly (25, 104, 148, 151–153). Patients with IS or TIA with microbleeds are as much as three times more likely to have subsequent ICH (104, 140, 151, 152) including hemorrhagic transformation (154) or recurrent IS (152, 153). Other predictors of ICH in acute IS include age, NIHSS score, DM and lobar, cortico-subcortical distribution of microbleeds, with 2-year risk for ICH increasing from 0.5% if no baseline microbleeds, to 8% if ≥5 microbleeds (140, 155). ICH-related mortality also is associated with greater baseline numbers of microbleeds, and based on this study, the authors concluded that in individuals with multiple (≥5) microbleeds, the risk of ICH-related mortality (3.8%) may outweigh the potential benefit of antithrombotic therapy (Adjusted Risk Ratio 2.5–6%) (155). In individuals presenting with symptomatic ICH, presence of microbleeds are associated with increased risk of recurrent hemorrhage (10, 11), which may be at sites of prior MB, particularly in deep ICH (156). In community-dwelling elderly, microbleeds also are predictive of future stroke, particularly ICH. In one study with 3.6-year follow-up, 19% of subjects with baseline microbleeds had strokes, compared with 1% of those without (148). Evidence from the PROGRESS trial suggests that blood pressure-lowering treatment in the setting of cerebrovascular disease is protective against both deep and lobar ICH. This suggests that as well as reducing risk of hypertensive ICH, antihypertensive therapy also reduces risk for ICH due to CAA (157). Although microbleeds were not analyzed, it could be inferred that individuals with microbleeds due to either process might similarly benefit. Shortly after early studies reporting prevalence of microbleeds in patients with ICH and stroke, early data emerged to suggest that the natural history of these lesions may be influenced by use of antiplatelet, antithrombotic, and thrombolytic therapies. Several studies have identified increased frequency of microbleeds in antiplatelet medication users presenting with ICH (158–160), IS (80, 140, 161), and VaD (80). Subsequently a large population-based study also reported a higher prevalence of microbleeds in antiplatelet users, but not anticoagulant users (162). In addition, prevalence of microbleeds has been noted to be higher in those with longer duration of antiplatelet use (161), and higher in those on aspirin than other agents (162, 163). However, other studies have not shown any association (36, 149). Increasing evidence is emerging in studies with longitudinal follow-up, although overall the evidence is limited by number of studies and relative scarcity of incident hemorrhage. Huang et al. tracked IS patients for 18 months, all were treated with antiplatelet agents, either aspirin or cliostazol. Of 719 patients, 11 developed ICH, all of whom had prior microbleeds. In addition, aspirin users had higher ICH rates than those on cliostazol, suggesting that not all agents share the same risk (163). Biffi et al. followed 104 primary lobar ICH survivors prospectively for 15–57 months. Recurrent lobar ICH was associated with aspirin use, previous microbleeds, and posterior white matter hypodensity on CT (164). The most recent meta-analysis of antithrombotic and antiplatelet use with microbleeds included 1460 patients with ICH and 3817 with IS/TIA. Microbleeds were more common in ICH patients on either warfarin or antiplatelet agents, but not in IS/TIA patients. In 768 patients with longitudinal follow-up (90 ICH, 123 TIA, 555 IS), ICH were more common among users of (any) antithrombotic agents, but warfarin use specifically was not significant. The authors acknowledged several caveats, including significant heterogeneity between studies, and that adjustments had not been made for some potential confounders (e.g., presence of hypertension) (165). The safety of newer antithrombotic agents (e.g., direct thrombin inhibitor, dabigatran, or factor Xa inhibitors rivaroxaban and apixaban) for non-valvular atrial fibrillation in individuals with microbleeds is at this stage unclear. To date, there is insufficient evidence to mandate withdrawal of any anticoagulant or antiplatelet agents, or use of alternative antithrombotic agents. Newer anticoagulants may confer reduced risk of ICH (166–168) however their lack of reversibility in setting of a putative bleeding event, and relative paucity of data in older patients is of some concern (169). Similarly, different antiplatelet agents may confer reduced ICH risk in IS patients with microbleeds [e.g., cliostazol versus aspirin, (163)], although more prospective data are urgently required to inform clinical decision-making (Table 2). Several prospective studies [e.g., Clinical Relevance Of Microbleeds In Stroke study, CROMIS-2, (170)] have been proposed to address this evidence gap, aiming to recruit large cohorts with non-valvular atrial fibrillation and ICH, comparing incidence of cerebrovascular events according to presence of microbleeds and anticoagulant therapies. Results from these and similar studies are awaited with great interest. In patients treated with thrombolysis for stroke or myocardial infarction, ICH is a feared complication, occurring in as many as 5.9% of cases (171). Concerns about safety of thrombolysis in individuals with microbleeds were raised with early series (172, 173). Subsequently, the large BRASIL (Bleeding Risk Analysis in Stroke Imaging before thromboLysis) study which analyzed MRI data from 570 IS patients in 13 centers in Europe, North America, and Asia, failed to find a significant association between baseline microbleeds and thrombolysis-associated ICH (102). However, there has been some criticism leveled at the study’s conclusions, including that it was underpowered, and did not stratify microbleeds by distribution. The prevalence of microbleeds was only 15%, somewhat lower than the majority of other IS studies, and there were few patients (only six) with multiple microbleeds. In two recent meta-analyses, presence of microbleeds was associated with a trend to increased risk of ICH post-thrombolysis, and there was a significant relationship between microbleeds burden and symptomatic ICH. However to date, interpretation of the literature is limited by heterogeneity in study size and design, and overall, each conclude that there is currently insufficient evidence to exclude patients with microbleeds from thrombolysis (174, 175). A relationship between microbleeds and other manifestations of hypertensive vascular damage has also been reported, including peripheral arterial stiffness (176) (in a sample with a greater proportion of deep microbleeds), and left ventricular hypertrophy with deep (but not lobar) microbleeds (177). Impaired cerebrovascular reactivity with 7 T functional MRI has also been reported with microbleeds in patients with atherosclerotic disease. Interestingly, the majority of microbleeds in this sample were in a lobar distribution, implicating CAA, rather than deep arteriosclerosis, as the underlying mechanism behind this reduction in vasoactivity (62). Deep brain microbleeds have also been linked with gait disturbance, such as reduced stride length, and impaired timed-up-and-go test. In particular, microbleeds proximal to major motor pathways, such as in the basal ganglia, thalamus, and frontal lobes, showed the strongest association with gait change. However, a link between temporal lobe microbleeds and reduced gait speed is also reported, a finding not directly explicable by anatomical pathways, which suggests that more widespread neuronal disruption may be present in these subjects (178). Individuals with multiple microbleeds due to CAA may present with cortical motor symptoms such as hemiparesis, dysphasia, or seizures (179–181), with associated findings of white matter change on MRI suggestive of vasogenic edema. These symptoms may be responsive to corticosteroid therapy (123). Prospective data on the microbleeds and mortality are limited. In 2004, Greenberg et al. identified and association between baseline hemorrhage burden (including microbleeds) and a composite endpoint, including death, cognitive impairment, or loss of independent functioning (11) in patients with ICH. In the PROspective Study of Pravastatin in the Elderly at Risk (PROSPER), 435 individuals with VRF or vascular disease were followed for 7 years. Over the study period, microbleeds were associated with a sixfold increased risk of stroke-related death. Individuals with non-lobar microbleeds had double the risk of cardiovascular disease-related death (but not stroke-related death), independent of VRF, whereas those with lobar microbleeds had a sevenfold increase in the risk of stroke-related death, but not cardiovascular death (142). Only relatively recently identified, microbleeds are increasingly appreciated as a marker of underlying disease states and risk for ischemic and hemorrhagic sequelae, and cognitive decline. However several questions remain to be clarified, including the rate of incidence for these lesions in aging and different disease states, and to what extent different therapies modify this rate. Further, it is still not clear whether microbleeds themselves are responsible for altered cognition in AD and cerebrovascular disease, or if they are simply a marker for the underlying pathology, namely hypertensive SVD (in cerebrovascular disease), or fibrillar β-amyloid deposition (in AD). Our understanding of their prognostic implications will continue to improve with ongoing longitudinal assessment. 21. Kwa VI, Franke CL, Verbeeten B Jr, Stam J. Silent intracerebral microhemorrhages in patients with ischemic stroke. Amsterdam Vascular Medicine Group. Ann Neurol (1998) 44:372–7. 27. Atlas SW, Mark AS, Grossman RI, Gomori JM. Intracranial hemorrhage: gradient-echo MR imaging at 1.5 T. Comparison with spin-echo imaging and clinical applications. Radiology (1988) 168:803–7. 32. Fazekas F, Kleinert R, Roob G, Kleinert G, Kapeller P, Schmidt R, et al. Histopathologic analysis of foci of signal loss on gradient-echo T2*-weighted MR images in patients with spontaneous intracerebral hemorrhage: evidence of microangiopathy-related microbleeds. Am J Neuroradiol (1999) 20:637–42. 73. Fazlollahi A, Meriaudau F, Giancardo L, Desmond PM, Villemagne VL, Rowe CC, et al. Automatic detection of cerebral microbleed in SWI using radon transform. Proceedings of ISMRM 2013 (2013). 75. Tsushima Y, Aoki J, Endo K. Brain microhemorrhages detected on T2*-weighted gradient-echo MR images. AJNR Am J Neuroradiol (2003) 24:88–96. 161. Ge L, Niu G, Han X, Gao Y, Wu Q, Wu H, et al. Aspirin treatment increases the risk of cerebral microbleeds. Can J Neurol Sci (2011) 38:863–8. Accepted: 06 December 2013; Published online: 06 January 2014. Copyright: © 2014 Yates, Villemagne, Ellis, Desmond, Masters and Rowe. This is an open-access article distributed under the terms of the Creative Commons Attribution License (CC BY). The use, distribution or reproduction in other forums is permitted, provided the original author(s) or licensor are credited and that the original publication in this journal is cited, in accordance with accepted academic practice. No use, distribution or reproduction is permitted which does not comply with these terms.